‘The Engineering of Reliable Embedded Systems’ (ERES2), documents an industry-proven approach to the development of software for reliable, real-time embedded systems, based on the use of second-generation ‘Time Triggered’ (TT) architectures. What distinguishes TT approaches is that it is possible to model the expected system behaviour precisely. This means that: [i] during the development process, we can demonstrate that all of the requirements have been met; and [ii] at run time, we can detect problems very quickly. The end result is that we can have a high level of confidence that a TT system will either: [i] operate precisely as required; or [ii] move into an appropriate state if a problem occurs. The above characteristics mean that appropriately-implemented TT systems provide a particularly effective means of meeting the requirements of various international safety standards, including IEC 61508, ISO 26262, IEC 62304, IEC 60730 and DO-178C. an aircraft jet engine (DO-178C, Level A). Further information about ERES2 is provided on this page. ‘ERES2’ will be of particular value to people who need to develop software for industrial, automotive, medical or aerospace systems, or safety-related household goods. The techniques presented in the book are intended to help developers achieve compliance with international standards such as IEC 61508, ISO 26262, ISO 13849, IEC 62304, DO-178C and IEC 60730. The ‘ERES2’ sample chapters may help you to decide if use of TT techniques is likely to provide benefits to your team or organisation. Comments from Michael J. Pont (author of ‘PTTES‘ and ‘ERES2’). “I wrote ‘PTTES’ over a 4-year period at the end of the 1990s. “In the time between writing ‘PTTES’ and writing the first ‘ERES’ book, I had the opportunity to work for almost 20 years on many challenging projects, in a range of different sectors. In the process, I learned a great deal about the successful application of TT software architectures in practical systems. I have tried to capture what I learned in the ERES book series. Related standards: IEC 61508; IEC 61784-3. Related standards: IEC 60335; IEC 60730. Related standards: IEC 60601-1; IEC 60601-2-1; IEC 62304; IEC 61508; EN / ISO 13845. 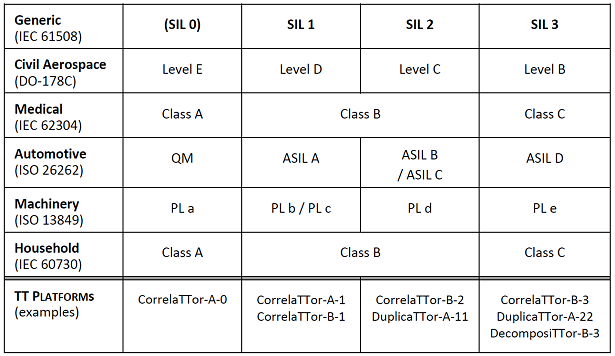 Most of the code examples in ERES2 target microcontrollers (MCUs) from STMicroelectronics (STM32F0, STM32F4), NXP / Freescale (LPC17xx), Infineon (XMC4000), and Texas Instruments (TMS570). For safety-related projects, we would aim to employ a processor with a ‘Safety Manual’ where this is possible. Such a manual is available for the majority of the processors that are employed in the book. Where safety is not a direct concern, the techniques presented in ERES2 can be applied with virtually any MCU. This material is available as a single PDF file. ‘ERES2’ is accompanied by a growing suite of public ‘Time-Triggered Reference Designs’ (TTRDs). You can download the latest public TTRDs here. Use of this code in commercial projects requires purchase of a ReliabiliTTy® Technology Licence. If you are aware of any other reviews of this book (good or bad) please let us know and we will add links here. Thank you. 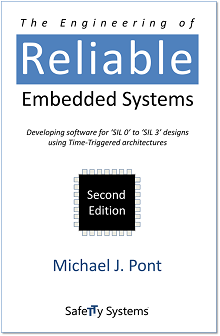 Pont, M.J. (2016) “The Engineering of Reliable Embedded Systems: Developing software for ‘SIL 0’ to ‘SIL 3’ designs using Time-Triggered architectures”, (Second Edition) SafeTTy Systems. ISBN: 978-0-9930355-3-1. £85.00. Fourth printing (with corrections): May 2017 (‘Edition 2.3’). The international hardback edition of ‘ERES2’ is available from Amazon.com and other online and physical bookshops. Pont, M.J. (2017) “The Engineering of Reliable Embedded Systems: Developing software for ‘SIL 0’ to ‘SIL 3’ designs using Time-Triggered architectures”, (Second Edition) SafeTTy Systems. ISBN: 978-0-9930355-4-8. £45.00. First printing: May 2017 (‘Edition 2.3’). The international paperback edition of ‘ERES2’ is currently available (only) from SafeTTy Systems. The cost of the paperback is £45.00 per copy (no VAT is charged on book sales in the UK) plus delivery. Delivery is: free in the UK; £10 to the rest of the EU (outside the UK); £15 to the rest of the world (outside the EU). Pont, M.J. (2017) “The Engineering of Reliable Embedded Systems: Developing firmware in compliance with IEC 61508, ISO 26262 and related functional-safety standards using Time-Triggered architectures”, (Second Edition) SafeTTy Systems. ISBN: 978-0-9930355-5-5. Rps 525/-. First printing in India: October 2017 (‘Edition 2.3’). The Indian paperback edition of ‘ERES2’ is currently available (only) from Pothi.com at a cost of Rs 525 plus delivery. The contents of the Indian edition are identical to the contents of the corresponding international editions. To support organisations that want to explore the use of modern TT designs – including many of the techniques and architectures presented in the ERES2 book – we have introduced our first DuplicaTTor® Evaluation Board (DEB). Using a DEB, organisations can evaluate design options up to ‘SIL 3’ / ‘ASIL D’ level (and equivalent). You’ll find further information on the DEB page. Since 2014, we’ve delivered our popular on-site TTb course to many organisations across the world: so far, we’ve introduced around 150 engineers to the use of TT software architectures in safety-related systems by means of this 3-day course, with a class size of around 6 being typical. The syllabus for the TTb course follows the contents of the ERES2 book closely. We appreciate that for individuals and small teams, on-site training can be a little expensive. We also appreciate that it can be difficult for any organisation to have their whole development team attend a training course at the same time. To address these challenges, we’ve introduced a cost-effective online version of our TTb course. Learn more – and watch a ‘course trailer’ – on our TTb page. The books in the “Engineering of Reliable Embedded Systems” (ERES) series and the related Time-Triggered Reference Designs (TTRDs) describe patented technology and are subject to copyright and other restrictions. in the ERES book series may be used without charge: [i] by universities and colleges in courses for which a degree up to and including “MSc” level (or equivalent) is awarded; [ii] for non-commercial projects carried out by individuals and hobbyists. Use of the techniques and code examples described in the ERES books in any commercial project (including training courses) or in university research projects (including PhD-level programmes and equivalent) requires purchase of a ReliabiliTTy® Technology Licence. Please contact us if you require further information about this book.